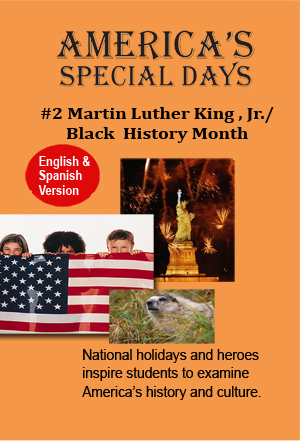 America’s Special Days focuses on Martin Luther King, Jr. who believed in peaceful protesting for civil rights. He dedicated his entire life to this cause, speaking, preaching and teaching that America should be a place where everyone should be treated fairly. The beginning of the program shows the turmoil of the sixties and the unfair treatment of minorities. Teachers may want to discuss this prior to showing the program. It features gatherings of school children across the nation paying tribute to Dr. King through song and speech. We visit King’s birthplace, church and museums. At the Civil Rights museum, you will see the Rosa Parks bus and a replica of the Woolworth lunch counter “sit-in.” We also witness the 1963 peaceful march on Washington, D.C. and the 1964 signing of the Civil Rights Bill by President Johnson, which helped bring King’s dream of equality to life. Teacher explanation may be helpful here. The program ends with a challenge to explore avenues of friendship.